Former Japanese Prime Minister Yukio Hatoyama arrived in Crimea for a three-day visit to get a sense of local opinion about reunification with Russia. He said that the referendum was “constitutional and expressed the real will” of the local population. Hatoyama was greeted by Crimean officials, including Crimea’s deputy prime minister, Georgy Muradov. The talks were scheduled to take place at the historic Vorontsov Palace, on the southern coast of the peninsula. “I’ve managed to hear different points of view, and I discovered that the referendum in the Crimea was conducted in accordance with the Ukrainian constitution, peacefully, in a democratic procedure, and has expressed the real will” of the Crimean population, the ex-premier said at a press conference in Simferopol, RIA Novosti reported. The former Japanese PM said that the events in Crimea a year ago should be viewed from a broader perspective, and he thinks that the stance of the Japanese Foreign Ministry isn’t the only right one. “I believe our task is to give Japanese society the truth about the democratic nature of the Crimean population’s will to become part of Russia,” Hatoyama said. Hatoyama said he wanted to “gauge local opinion” about the reunification of the peninsula with Russia nearly one year ago. The former PM added that he feels local opinions have not been accurately reported on. "I want to see with my own eyes how people in Crimea are feeling," he said on Monday, prior to his visit. Meanwhile, the Japanese government has reacted to the former prime minister’s visit with outrage. Government spokesman Yoshihide Suga called Hatoyama’s trip an “extremely thoughtless act [that] causes extreme disappointment,” RIA Novosti quoted him as saying. 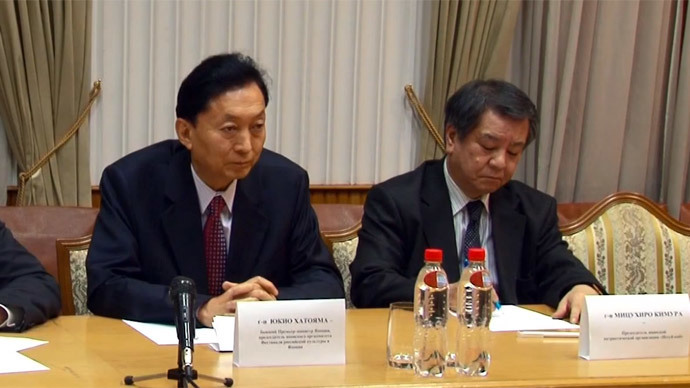 Suga, the government spokesman, said that Hatoyama’s visit could lead the world community to “misunderstand” Tokyo’s position, as it does not recognize Crimea’s accession into Russia from Ukraine. Among the events scheduled during the ex-premier’s visit, is a speech to university students in Crimea on Thursday. Hatoyama became Japanese prime minister in 2009 as leader of the Democratic Party of Japan. He was in office for nine months.